We have had an OVERWHELMING amount of entries to our little giveaway and it is AMAZING!!! Well done you wonderful people, we know how gorjuss these mugs are… so gorjuss they have gorjuss on them and hopefully when you get them, gorjuss in them too. Remember you can only drink stripey drinks in these cups!!! That is the LAW of Gorjuss.. Before we get to the winner, I have some new products to show you…. Also with the release of the new collectible Canvases and the range of Canvas Wrapss, we are stopping selling our choose your own Cavas wrap prints and we will be stopping canvas wraps from Gorjuss art too. By the end of this week you will find them gone from our shops. So if you have a desperate need to get one of our designs not currently on sale in your local shops please be quick. If you miss out don’t panic… the range of canvases will grow and grow over the coming months. Right time to get to the reason you are all readying this tonight!!! Now we’ve got something special for you all , it’s been a while so it’ most def a time for A GIVEAWAY!!! YOU COULD WIN A FULL SET OF SIX Gorjuss™ MUGS (display case shown left not included). This set is worth £50 ( $81 approx.) These super sweet bone china mugs have the full image on one side, Merging seamlessly into a close-up, there is a tiny accent from the image, on the inside of the mug, and the handles have a wonderful black and White stripe detail to them! There are 6 mugs, in 3 diff designs, all are dishwasher safe too! How would you describe the new “Canvas Easel Art”, But here’s the twist, We want ONLY NEW, NEVER HEARD BEFORE WORDS!!! E.g: gorj-licious OR gorj-tastic! 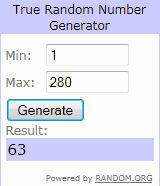 And you entered and re-tweeted like crazy, giving us a grand total of….280 entries 110 comments, and 170 tweets. So I will explain how we judge the winning comment… we will visit random.org and draw a random number between 1 and 280… then we will START counting through the comments and then once finished the tweets. So lets get our winning entry number. Congratulations Mathilde your Gor–dorable suggestion has won you our set of mugs as donated by our good friends at Santoro. We will try to run more competitions over the next few months too… so please do check back with us soon. Things are still very hectic in our lives, Suzanne continues to battle hard to try to regain some abilities and we hope to have good news to share with you, sadly tomorrow I am attending my Grandmothers funeral.. so if you are in desperate need of help from us, please be patient and I will try to catch up with you on Tuesday. Thank you all for being SO amazing…. Thanks for reading, if it made you smile, please take a second to share this post with your friends and make them smile too ! YES We’ve made it easy for you with the buttons below, just choose where you want to post it too and “click“! TADA! omg i lov all those pic, keychain, n everything.. especially d mug.. any way im from malaysia n im a comic collectable..
cartoon? trust me, i lov all tat.. u hav a great talent.. Funny images.And its very interesting post.Thanks for sharing it.